SIA - Security Industry Autority s.r.o. asset and personnel protection. We are proud to be professional and dutiful. SIA Security Industry Authority s.r.o. was founded in 2009. 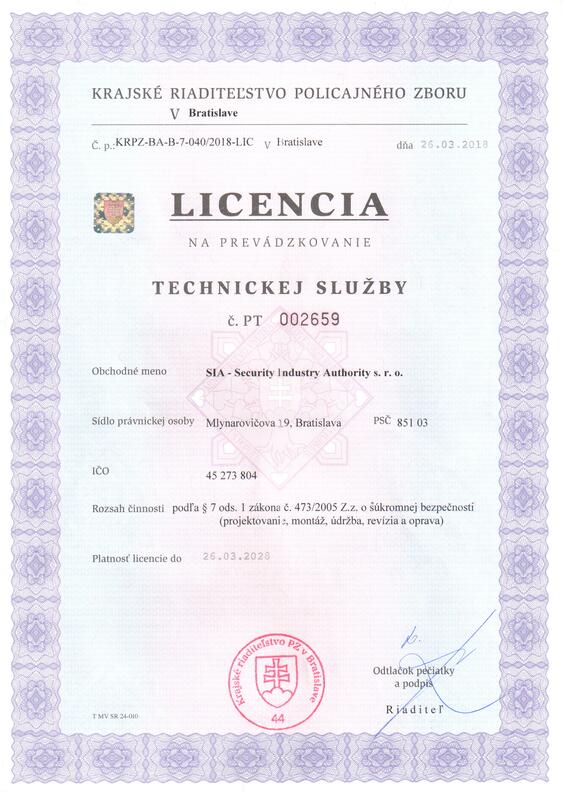 We are one of the oldest companies operating in the field of security services in the Bratislava region. We offer integrated security, administration and facility management services up to par with the highest European standards. We have years of practical experience in providing a wide range of security services. The fact that we have been working for certain customers for longer than five consecutive years illustrates the quality of our services and high customer satisfaction. We strive to implement new types of services and products (e.g. as of 2016, we offer cleaning services as well). Our services are in line with the security needs and requirements of our clients whether in the private or public sector. There are 250 employees working for our agency with an average age of 35. Lower and middle management is promoted internally within the company, therefore approximately 80% have been with us for over 5 years. Among the basic requirements for employment within security services are the ability to demonstrate a clean criminal record, clean bill of health and professional education. We train our employees to meet the requirements in the fields of work safety, fire hazard, professional and legal matters and principles of conflict resolution. Experienced executive management led by Ján Vaškovič can offer years of experience in all the services we offer our customers. Our company is customer oriented and we put emphasis on a continuous improvement of service quality. SIA s.r.o. offers services regarding the alternate employment compensation for the disabled. In addition, the company now includes SIA SERVICE, spol. s r.o., which provides employment agency services. Our company offers a complex range of security services of assets, property and persons. Our work is always based on security analyses, risk assessment and localization of critical points in regards to protection of personnel, tangible and intangible assets. Our security management is qualified to devise plans for facility and personnel protection. Physical presence of the security service personnel significantly reduces the risk of property theft of damage. We can secure small, medium-sized and large buildings, halls, production and business premises. We provide security service for social and cultural events, and we are able to provide highly professional protection of VIPs. We have a wealth of experience with events known in media. We provide discreet and highly secure way to transport money. We offer daily as well as a special transfers of valuable items, also at greater distances. Our services also include installing security systems which can help you better protect your assets. Our company carries out connection of buildings to the centralised protection and surveillance system. When an alarm is detected, a patrol is dispatched to the site. Our personnel consists mainly young and trained people. Good manners and discipline are the essential traits of every employee of our company. Protection of industrial sites, office buildings, shopping centres and construction sites. Providing security for cultural and social events and sporting events. Operation of technical equipment and systems (instrumentation and control, electronic security systems, electronic fire signalling). Transport of cash and valuable items. Electronic control the entrances and exits of vehicles, entry/exit of persons. Connection to surveillance and protection centre. Servicing and inspection electronic alarm systems and fire signalling systems. We provide our clients with reliable and fully professional services. It doesn’t matter if it’s government institution, bank, small business, retailer or private person. 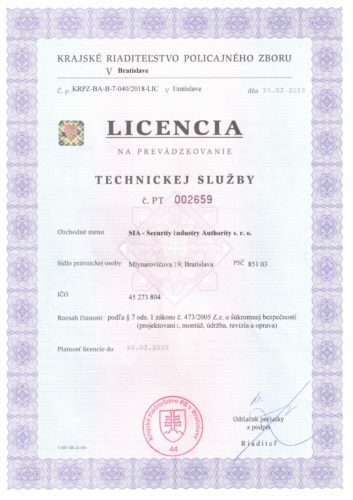 All available licenses and certificates that are necessary for managing private security service are updated on regular bases. Please contact us if you have any questions or are interested in our services. 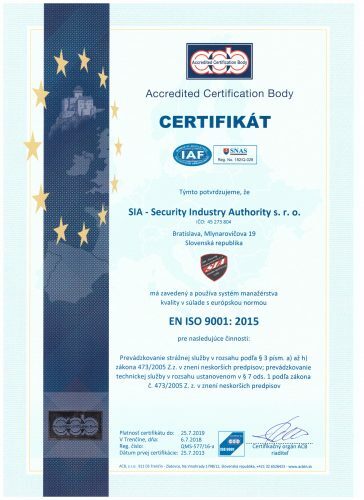 SIA – Security Industry Authority s.r.o.